Light the most perfect symbol of love when your flames touch the wick of this Two Shall Become One Unity Candle! These bestselling palm wax wedding candles are available in Ivory wax and features pitch-perfect accents that celebrate the true meaning of your special day! 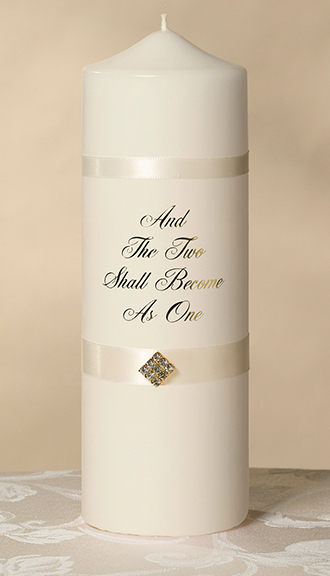 The candle is decorated with the timeless verse, "And The Two Shall Become As One." It is wrapped in an ivory satin ribbon and features a gold plated diamond ornament. The verse is also printed in gold. Sold individually. Measures 8-1/2" tall x 2-7/8" round. Decorating Tip: Whether you make these Two Become One Wedding Candles part of your unity candle ceremony or use them as a centerpiece (many unity candles are perfect for this), you'll want to be sure you outfit your pillar candle with a set of wedding taper candles and display them with an elegant unity candle holder! Find many more candle styles for letting your love glow in our complete collection of wedding unity candles!